Pros: A naturalistic, versatile set and a fantastic lead actress with a strong singing voice. Cons: It’s hard to fully appreciate the larger group numbers in this size venue; I would love to see it on a bigger stage. A genuinely original new musical with an eye-catching set design and a superstar lead. The Clockmaker’s Daughter sells itself as a fairy tale and justly so, given the comfortable combination of reality and magic in its plotline. In grief for his late wife Constance, clockmaker Abraham, played by Lawrence Carmichael, builds a replica woman. The only snag is that her parts are mechanical and she must be wound like a clock to stay animate. Any story with an element of fantasy sets itself a hard task, because it has to remain believable within the limits of its own reality, but this musical succeeds in that. The writing is sincere enough that it never seems silly how much everyone in the village loves this intriguing new addition to their community, a beautiful girl with marvellous dressmaking skills – why wouldn’t they, she’s lovely! Excellence in dressmaking pervaded both plotline and production. Costumes are rich in detail and the whole cast looks gorgeous with a very European 19th century village feel. Not something I generally comment on (as watching musicals in the West End I sit in the poor people seats), but the make-up and hair looked very polished and professional up close. I didn’t expect to see such an elaborate and attractive set design in a pub theatre either, so I was completely taken aback by its intricacy and flexibility. Outdoor village scenes switched to drawing rooms with speed and finesse; the detail was matched by the incredible economy of it. What has been achieved technically in the small theatre space is fantastic, but I would love to see it on a larger stage in order to fully appreciate the visual breadth of the big group numbers. However, the intimacy of the space does work in the musical’s favour as well, since having the musicians so visible and close really warms the atmosphere. The Landor is a pleasant pub to visit for a drink, the staff being affable and the drinks being mostly alcoholic. Seating in the theatre however, like in a lot of pub theatres, could be improved, but then with my back I’d probably complain on a silk chaise longue with a private pillow. The highlight of the night for me was Jennifer Harding, who plays Constance with the skill of a seasoned West End star. In the first act Constance’s studied clocklike movements and deadpan delivery are completely convincing as the automated being. 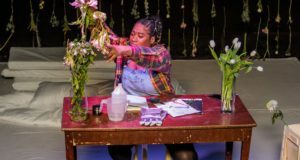 Harding really develops the humanity of her character after the interval, acting the emotional musical numbers with the right balance of sincerity and showmanship. In the group musical numbers such as Market Day the whole cast shines as a collective, and I liked the way the energy of these pieces broke up the more pensive solos. Some voices are weaker than others, but the melodies are sweet and the lyrics intelligent, so all in all there’s not a dud number to speak of. 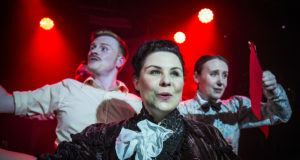 Aside from Harding, Alyssa Martyn and Alex Spinney stand out as the newlywed couple of Spindlewood village – very watchable and strong vocals. 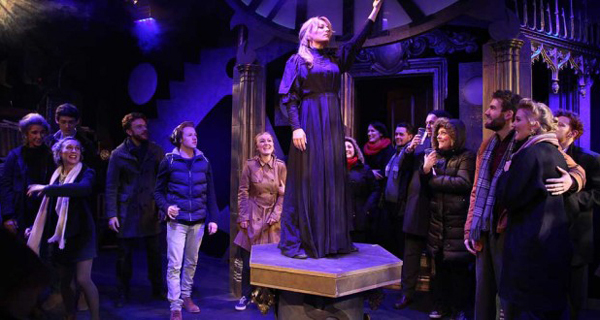 The Clockmaker’s Daughter is a genuine and original new musical with a compelling leading lady. A visit to this run at the Landor guarantees a great ambience and great visuals. And I can assure you you’ll be tapping your toes to a few of the numbers!